PRODUCT DESCRIPTION: Low odor spray which comes with it's own spray bottle for treating pets with fleas and ticks. 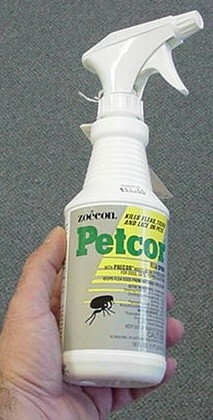 Petcor includes Precor which enables it to actually kill flea eggs. This makes it one of the best "pet sprays" available for long term flea control. WHERE TO USE IT: On cats and dogs. RATE OF APPLICATION: This is determined by the size of the pet and how thick their fur is. Expect to treat every week or two during tick season. And soaking the pet is not needed; 5-10 squirts rubbed into the fur is usually plenty. RELATED PRODUCTS FOR THE PET: FLEA COMB OXY MED ITCH RELIEF SPRAY MELALEUCA SHAMPOO WATER BASED (GENTLE) PERMETHRIN PET SPRAY TRIPLE PYRETHRIN PET SHAMPOO (great smelling and very effective) FLEA DIP CONCENTRATE FLEA POWDER (for treating dogs and cats). Hello. 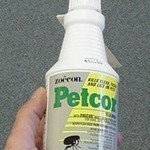 Petcor sounds like the product that will do the job on my cats. One thing I want to know is how often can you spray this on your cats?? I have used products before that I have sprayed on a cat. Flees died, but within 2 days the cat had flees all over it again. These cats come in and out. I do rescue for cats. Get a lot of them dropped off here too. So flee problem is a major problem. Petcor can be applied as needed. And when you treat, it will be strong enough to kill active fleas on the pet right away. But the immediate kill action is short lived so once the pet is introduced to an environment where fleas are active, new fleas jumping on it will live for a few days before dying. In other words, the treatment will still be active. But it won't be strong enough to kill fleas on contact like when its first applied. On a side note, its imperative that the home and yard get treated just as much if not more then the cats. Remember, fleas will be laying eggs and these eggs will be hatching anywhere the cats go. So if you don't maintain these common areas, the cats will just keep collecting new fleas and the problem will never go away regardless of how often you treat them with Petcor.